Explore exciting career opportunities in public health at an open house at the UNMC College of Public Health on Friday, Nov. 15. 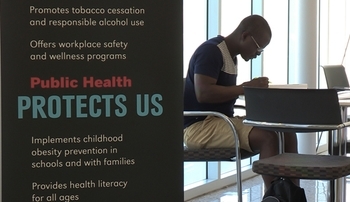 The open house will be from 9:30 a.m. to 3:30 p.m. in the Maurer Center for Public Health, 519 S. 40th Plaza Circle. This one-day event provides prospective students with a basic understanding of the field of public health and how the College trains professionals to tackle health problems from neighborhoods to global populations in a multidisciplinary approach that promotes healthy communities, eliminates disparities and ensures clean environments. The open house is for prospective students, pre-health advisors and career counselors who want a greater understanding of the field of public health and all the opportunities for education and research in the College of Public Health. The Center for Biosecurity, Biopreparedness, & Emerging Infectious Diseases. The Center for Reducing Health Disparities. The Central States Center for Agricultural Safety and Health. The Cancer Epidemiology Education in Special Populations. The research part of the day features a current COPH student poster display and presentations. In addition, experts will lead a discussion on human trafficking from a public health perspective at 1 p.m., in Room 3013. Panel members will include representatives from the College of Public Health and the Lincoln Child Advocacy Center. To register and review a full schedule, click here.